Collins Booksellers - On the Take by Jerome P. Kassirer, M.D., 9780190292041. Buy this book online. by Jerome P. Kassirer, M.D. We all know that doctors accept gifts from drug companies, ranging from pens and coffee mugs to free vacations at luxurious resorts. But as the former Editor-in-Chief of The New England Journal of Medicine reveals in this shocking expose, these innocuous-seeming gifts are just the tip of an iceberg that is distorting the practice of medicine and jeopardizing the health of millions of Americans today. In On the Take, Dr. Jerome Kassirer offers an unsettling look at the pervasive payoffs that physicians take from big drug companies and other medical suppliers, arguing that the billion-dollar onslaught of industry money has deflected many physicians' moral compasses and directly impacted the everyday care we receive from the doctors and institutions we trust most. Underscored by countless chilling untold stories, the book illuminates the financial connections between the wealthy companies that make drugs and the doctors who prescribe them. Kassirer details the shocking extent of these financial enticements and explains how they encourage bias, promote dangerously misleading medical information, raise the cost of medical care, and breed distrust. Among the questionable practices he describes are: the disturbing number of senior academic physicians who have financial arrangements with drug companies; the unregulated "front" organizations that advocate certain drugs; the creation of biased medical education materials by the drug companies themselves; and the use of financially conflicted physicians to write clinical practice guidelines or to testify before the FDA in support of a particular drug. 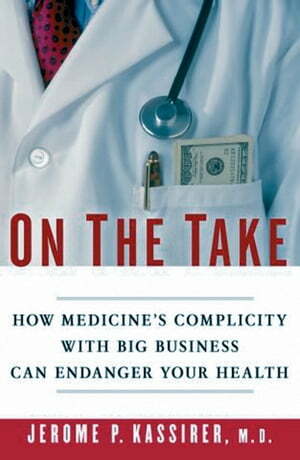 A brilliant diagnosis of an epidemic of greed, On the Take offers insight into how we can cure the medical profession and restore our trust in doctors and hospitals.